The recent spin-off series to the well-known Attack on Titan/Shingeki no Kyojin anime, Shingeki! Kyojin Chuugakou is a school comedy set in a junior high school. 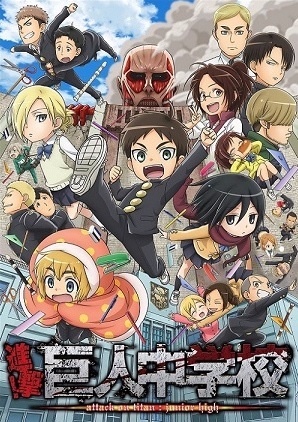 It focuses on main characters Eren and Mikasa as they battle with Titans. But, as the title and image suggest, the spin-off features kawaii chibi versions of Eren and co, and includes key scenes from the original such as the initial Titan scene with Eren's a narrative. Even the art style has been changed to make it look more kid-friendly, but don't let that fool you - the nature of the characters remain the same and Titans still exist in this world. Shingeki! Kyojin Chuugakou is a nice breather from the original series due to its main focus being comedy and including other characters from the main story such as Sasha the potato-lover, only this time it's a watermelon. Some of them are shown whilst Eren and Mikasa run to school, and as Eren says, it's a long journey if 4 or more characters are shown whilst on their way there. And given the fact that this is a parody, their encounters aren't so...normal, but they are funny. But this wouldn't be a true parody if there is only one Titan throughout. Shingeki! brings them into the story by including a section of the school purely for Titans, which Eren and co accidentally enter. Eren then promises to get rid of every Titan after something precious is taken away from him (not his mother this time!) before the group is attacked by stationery. Cue an introduction of all the characters in Eren's class who are also in the Survey Corps with him, and the rivalry between him and Jean. As I mentioned earlier, each character has the same nature and personality they had in the original, only this time it's much funnier. There's also the key scene when Sasha is found eating, but now it's a rice ball rather than a potato - she is in school after all. Soon come the Titans, not as human-eating Titans, but as school lunch-eating Titans! It's so funny how Eren refers to something being taken away from him as his lunch this time before other people's lunches are taken away from them (just how much food does Sasha have on her?) and then has an epic fail moment when he tries to attack the Colossal Titan. And soon after we see Chibi Levi! For now there's only one episode out, but let's hope more will follow soon since there's a preview of episode 2 after the credits. Any Attack on Titan fans should watch this comedy parody which I also recommend to those new to the series.